"Growing up in a Hungarian home, my Mother and Grandmother were so very talented in all the arts. Embroidery was one art they excelled in; doilies, napkins, tablecloths, etc. This theme is special to me and brings back wonderful memories. The beautiful rich colors and designs are a delight to the eye. 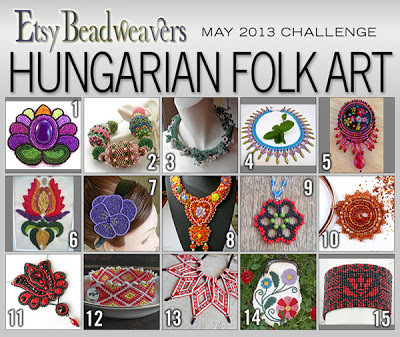 Create your own art from the inspirational designs [form an image search], or any reference for Hungarian Folk Art of your choosing." If you're not familiar with Hungarian folk art, you can take a peek at this board I had made as inspiration right for this challenge. I am making one each month and I'm so pissed I couldn't take part in this month's. I have been out of town twice and then had some issues that made it impossible to make something on time. I had a beautiful idea so I plan to make it anyway later, in the meanwhile I have voted for my favorite and you can too until may 16th! Ready to party with Gatsby?